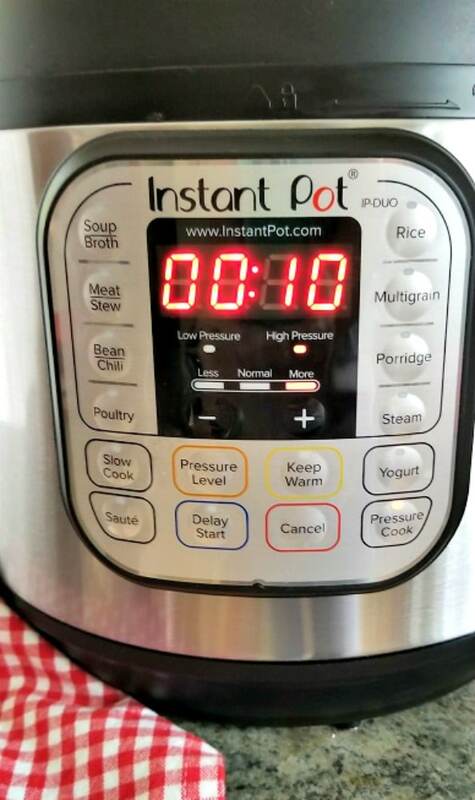 Did you know you can convert any slow cooker recipe to cook in the Instant Pot? All you need is this Instant Pot cheat sheet! No more googling for cook time directions! Converting meals to the Instant Pot is super easy and will leave you wondering why you didn’t try this sooner! So many people spend a lot of time searching the web for Instant Pot specific recipes and do not realize how easy it is to use the recipes they already have. 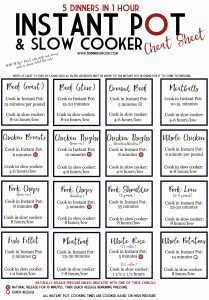 The 5 Dinners 1 Hour meal plans have some fabulous slow cooker recipes (among other types of recipes too). Many people in our Facebook community ask how they can convert these slow cooker recipes to cook in their Instant Pot. Keep reading to find out how to use this Instant Pot cheat sheet to make slow cooker recipes work for your pressure cooker, plus a few tips on using the Instant Pot (because I know there are some of you out there that still have it in the box from Christmas!). So are you ready for it? This is such a simple process. . . the key to converting recipes to the Instant Pot is just looking at the meat type used in the recipe. Once you know what type of meat the recipe calls for, go to the Instant Pot cheat sheet and use the appropriate cook time. The cheat sheet also gives tips for whether to use quick release or natural release. If you are cooking a meatless meal, such as a vegetable soup, it will only need to cook for about 5 minutes. Now there is one additional detail: you do need to think about how much liquid is in the recipe. The Instant Pot needs liquid in order to build up pressure, so if there is no liquid, it will not cook and will also burn. There needs to be about 1 cup of liquid in order for it to come to pressure (although I live on the edge and often only use 1/2 cup). Keep in mind, though, that foods which absorb moisture, like rice and pasta, will require some extra liquid. So what type of liquid should you use? You can use water, but for more flavor, use chicken, beef, or vegetable broth (depending on what flavors the recipe uses). Also, recipes that already have some other type of liquid, such as tomato sauce or BBQ sauce, will not need much, or sometimes any, additional liquid. Now that you know the cooking time, thanks to the handy dandy Instant Pot cheat sheet, and you have any additional liquid added, it’s time to get the Instant Pot going! If in doubt, just use the manual button and almost always use high pressure (there are very few things that need the low pressure button). If you use a preset button, you can still adjust the time to the cook time using the plus and minus buttons. Don’t forget to set the sealing knob to seal before you press start! Remember that it will take about 10-15 minutes for the Instant Pot to come to pressure before it starts counting down the cook time. The more food in the pot or the colder the temperature of the food, the longer it will take to come to pressure. Frozen food will take longer to come to pressure, so give it a little time. If you choose to sauté vegetables or the meat first, the pot will come to pressure faster! When the cook time is up and the Instant Pot beeps, you can either use quick release (manually releasing the pressure) or let it naturally release. You can refer to the Instant Pot cheat sheet to find out which release type works best for which meat type. I often use quick release because I am impatient! Watch out as you release the pressure; the steam comes out of the seal valve quickly, so move out of the way! You really can cook just about anything in the Instant Pot and this Instant Pot cheat sheet is going to make it even easier! Be sure to print it out and post it in a handy place, like the inside of a cabinet door. 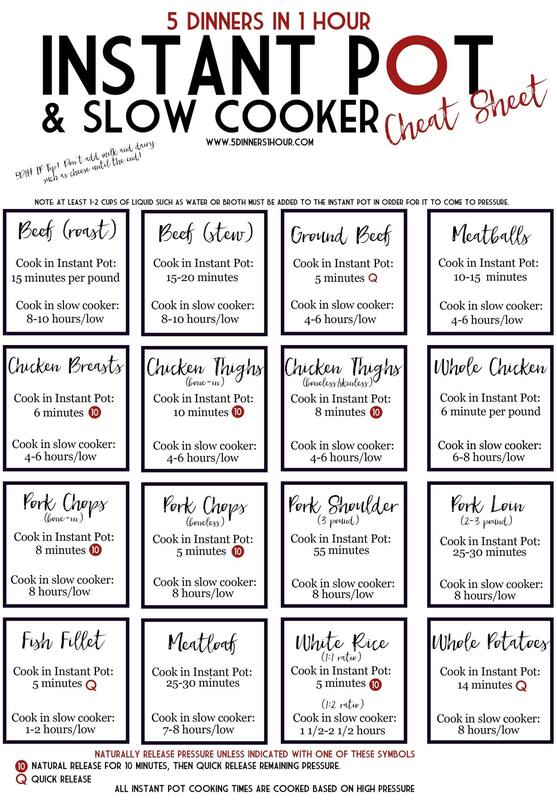 Use this cheat sheet to quickly convert slow cooker recipes to the Instant Pot! If you are new to the Instant Pot and want to try out a recipe (without having to convert), check out this Instant Pot cajun rice recipe!